15 August 2004 (by Alfred Blankson)-- My seventeen year old daughter was returning to us alone to London. Despite having stamped UK visa and both Ghanaian and British passports, and being a minor, an immigration officer bullied and harassed her on a late night flight (she was last in queue), while she was also feeling feverish. He extorted £100 off her, claiming she was the sister of the person in the passport, and pocketed the money. 26 May 2004 (by Rohit Lakhani) -- I've had the pleasure and unique opportunity of checking-in at Accra's Kotoka International Airport on several occasions. The general service and style of the airport that of a third world country airport. Regular delays of flights, inattentive staff, and long, slow-moving queues. However, this all adds to the personality of the airport. It has character. Before your flight, you can grind on some tasty kebabs at the thatched-roof kiosk near the parking lot. I do feel you can enjoy this airport if you go with an open mind and adventurous spirit. 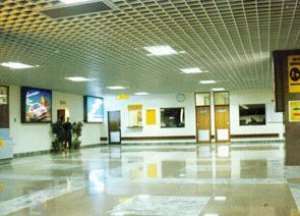 4 April 2004 (by Sasha Tufuor) -- Kotoka airport has certainly been "cleaned up" in terms of its appearance. Unfortunately I cannot say the same about its personnel staff. My most recent encounter with Kotoka airport was on 31 March 2004. It's certainly left me disappointed enough to want to write this email. Having arrived over 2hrs early in order to check in for my flight, I then had to endure the following frustrating events. Having checked in, I made my way to what appears to be a "Security Point". I was asked to complete an immigration card. As I didn't have a pen, I asked a member of staff to lend me his. I was totally ignored. Another traveller (a Ghanian man), who was obviously as embarrassed as I by this apparent curntness, informed me that I would be seen to soon. Meanwhile, an official with his family were waved through before my request was attended to. This particular member of staff made no attempt by way of an apology for ignoring me for a over five minutes. I completed the card and handed it over. He took it, examined it along with my travel documents and then waved me on like a naughty school child (I felt sufficiently humiliated to feel like a 10 yr old and not an adult of 37yrs). I then foolishly made the mistake of wanting to purchase a drink in the bar next to the Duty Free Shop. I requested a glass of wine from a female bar staff. She advised me that I could only purchase a bottle of wine and then walked away before I could even enquire about an alternative drink. I was sufficiently aghast enough to just stand rooted for a minute or so. Another bar staff noted this, approached me and asked if I required a service. I informed her that I did but I didn't think I would receive it (I then went and sat down). Having eventually made it to the departure lounge, I found myself along with other passengers, waiting for over an hour to board tour plan. There were no announcements to explain this delay. In actually fact, the apology came from the captain (KLM). I can only say that I feel sufficiently frustrated and humiliated enough to seriously consider not returning back to Ghana in the immediate future. 11 March 2004 (by Sandra Appeti) --Kotoka is looking great especially with the recent renovations which have taken place. It would be nice however if there were trained personnel to run it. I spent a lot of time travelling to and from Kotoka during my Dec 03 – Jan 04 trip due to baggage delays. To say I was frustrated would be an understatement. Not living in Ghana means my mode of travelling was by taxi. Kotoka however does not permit taxis to park at the accessible car parks except private cars. When you have luggage it is a nightmare. I had to cross 2 lanes of busy traffic to get to a taxi with 3 heavy suitcases because the car park attendant will not even let the taxi drive into one of the accessible car parks to collect my luggage. The Staff are rude, from car park attendants who are unsympathetic and lack flexibility to custom officials who will harass you if you look like an easy target. Not forgetting security guards who are constantly begging for change. Even Staff at the customer service desk are not helpful and I found myself asking one of the staff what the point of having a customer service desk was. All in all, customer service seems non existent in Kotoka unless you are willing to wave money around. 26 February 2004 (by Stephan Neuhaeuser) -- Kotoka is a wild airport! Confirm your return flights early (its a must!) and check in as early as you can (e.g. it is possible to check in in the morning if you leave in the evening) - as a foreigner you will probably end up paying a local a small sum for "helping" you to accomplish check in. These "helpers" can be very insisting. And then leave the airport for a cool drink at the Shangri-La Hotel, a 5 minutes taxi ride away. Finding a taxi is no problem, as there is a big competition in the taxi business. At the airport there are practically no bars, restaurants and only a few shopping outlets. Waiting is not very comfortable.